Seven undergraduate mathematics majors were inducted into the Vanderbilt University Chapter of the Pi Mu Epsilon Society in December 2017. 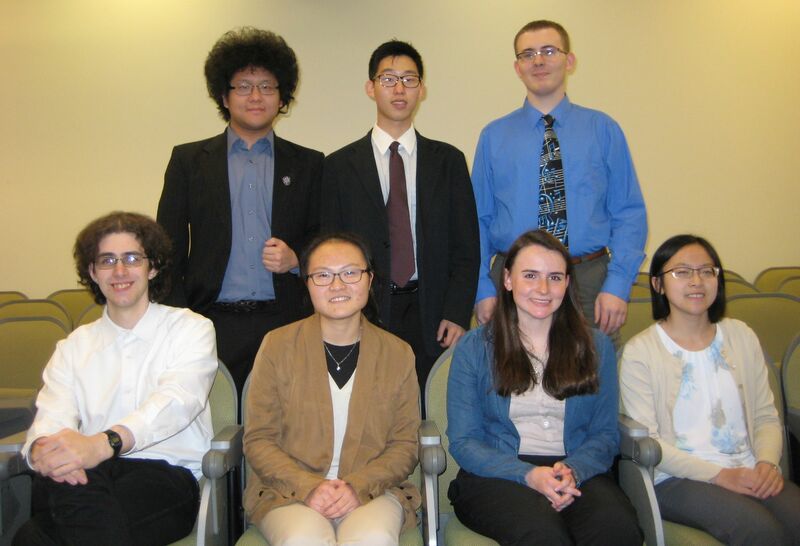 The new members are: Gregory Bixler, Yuhan Guo, Hannah Hagan, Min Soo Kim, Robert Saskowski, Rebecca Wood, and David Zhang. Pi Mu Epsilon (PME) is an honorary national mathematics society dedicated to the promotion of mathematics and recognition of students who successfully pursue mathematical understanding. The organization sponsors an annual conference in conjunction with the Mathematical Association of America’s (MAA) annual MathFest. It also sponsors a journal devoted to topics in mathematics accessible to undergraduate students. To be eligible for election to PME, undergraduate students must have completed at least the equivalent of two semesters of calculus and two additional courses in mathematics, at or above the calculus level, all of which lead to the fulfillment of the requirements for a major in the mathematical sciences. In addition, they must have maintained a grade point average equivalent to that of at least 3.0 on a 4 point scale, both for all courses that lead to fulfillment of requirements for a major in the mathematical sciences, and also for all courses that lead to fulfillment of requirements for an undergraduate degree. The Vanderbilt University Chapter of PME was founded in 2013. Senior Lecturer and Assistant Director of Graduate Studies Lori Rafter serves as the chapter’s faculty advisor.